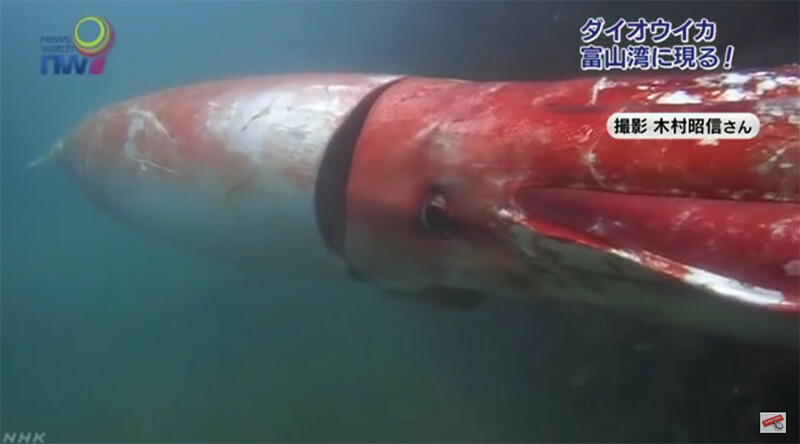 Locals in Japan’s Toyama Bay had a close encounter with a rare creature this week when a giant squid left its deep sea dwelling to swim into Mizuhashi port. The four-meter long squid was reportedly spotted by fisherman under their boats and stuck around to entertain a gathering crowd for several hours. Footage shows the red and white Architeuthis flailing its long limbs around as a diver gets a closer look of the majestic beast. Legends such as the Kraken sea monster have contributed to intrigue surrounding giant squids and, astonishingly, it wasn’t until the early 2000s that a picture of one in open ocean was captured. According to the National Geographic, the first-ever recorded image was taken in the North Pacific Ocean off Japan by researchers Tsunemi Kubodera and Kyoichi Mori. Previous to this, only dead squids or animals held in captivity had been pictured. The giant squid seen in Toyama Bay is believed to be in its infancy, since adult squids can grow up to 14 meters long, roughly the size of a semi-trailer. Diver Akinobu Kimura helped guide the tentacled leviathan out of the port back to deeper waters. Kimura told CNN that despite the strong suckers and long limbs, the opportunity to swim with a giant squid was too good to pass up.